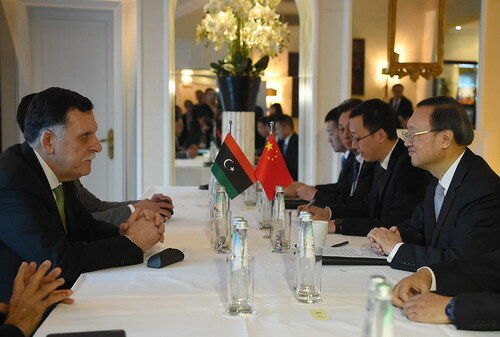 On February 16, 2019 local time, Member of the Political Bureau of the Central Committee of the Communist Party of China (CPC) and Director of the Office of the Foreign Affairs Commission of the CPC Central Committee Yang Jiechi met with Prime Minister of the Government of National Accord Fayez Mustafa al-Sarraj of Libya on the sidelines of the 55th Munich Security Conference in Munich. Yang Jiechi expressed that the Chinese side attaches great importance to developing friendly and cooperative relations with Libya. The governments of China and Libya signed the memorandum of understanding on the joint building of the Belt and Road Initiative last year, contributing to advancing bilateral practical cooperation. At present, the political settlement process of the Libyan issue has entered a new critical stage. The Chinese side welcomes the three-step solution proposed by Special Representative of the Secretary-General of the United Nations to Libya, and is willing to work together with the international community to make positive contributions to realizing long-lasting peace and stability in Libya. The Chinese side stands ready to work with African countries including the Libyan side to well implement the outcomes of the Beijing Summit of the Forum on China-Africa Cooperation. Fayez Mustafa al-Sarraj said that Libya-China relations enjoy sound development. The Libyan side thanks China for its just position on the Libyan issue as Libya is in a special phase. The Libyan side is willing to carry out high-level exchanges with the Chinese side and strengthen cooperation in economy and other fields. Libya welcomes Chinese enterprises to participate in the reconstruction of Libya. Speaking highly of China’s policy toward Africa and China-Africa cooperation, the Libyan side stands ready to intensify communication and coordination with the Chinese side in multilateral affairs.